Sans titre is an exceptional work from Molinari's 1960s cycle of abstract works that established their pictorial structure through horizontal and vertical stripes and sections of evenly modulated, contrasting colours. Molinari considered colour to be a form of energy and stated that he used "colour as a structural element, not as light, but as energy." 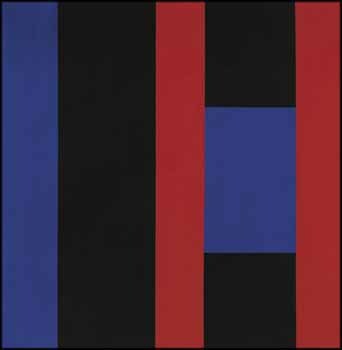 Molinari's juxtaposition of colours creates vibratory effects along their intersections, and these colours appear to change when bordered by other colours and when used in different sizes and shapes - as with the blue in Sans titre, when bordered by either black or red. Molinari explained that "the same colour would have a different function according to its position in the 'structure.' " Thus works such as this electric painting are perceived by each individual viewer as an exciting and dynamic visual event.